Budget airline Ryanair has abandoned plans to operate transatlantic flights, just days after it said its board had approved the measure. In a statement, Ryanair said it "has not considered or approved any transatlantic project and does not intend to do so". 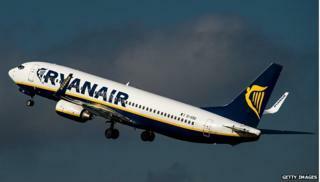 On Monday, Ryanair had said its board approved a plan to operate budget flights to the US within five years. Ryanair first aired the plans in 2008. Earlier in the week, a spokesperson told the BBC long-haul flights were "dependent on attaining viable long-haul aircraft and we estimate that's four to five years away". It said it would like to offer low-cost flights between 12 to 14 European cities and the same number of US cities. Currently, the transatlantic route is dominated by long-established airlines, with British Airways and American Airlines the main players. Oslo-based low-cost airline Norwegian Air Shuttle began a service to the US in 2013, but recently blamed the costs of its expansion, including disputes with US regulators, for its first loss in eight years.